… one sentence that launched a million Google searches. What does Jamie mean when he calls Claire Sassenach? He says it so sweetly — is it an endearment? Well, sort of. And what does dinna fash mean? Is it a reassurance? Definitely. 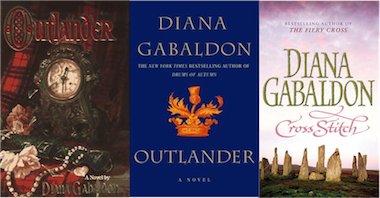 Full of adventure, romance, and historical detail, Diana Gabaldon’s first Outlander novel is also full of Scots and Gaelic — two of Scotland’s three indigenous languages (the other being English, of course). The Outlander Wiki is a great resource for the Gaelic you find in the novels, and we at The Bottle Imp have asked Scottish Language Dictionaries to take a closer look at the Scots. Now, as you’re riding through the heather with Jamie and his men, you’ll know exactly where they’re stopping, what they’re eating, and what they’re saying. This column takes a historical approach — we’re interested in our eighteenth-century story, after all — but most of these words are still current and used today. You can find all of them in the free, online Dictionary of the Scots Language, and if you have any questions, you can email one of the editors at Scottish Language Dictionaries: mail@scotsdictionaries.org.uk If you have any comments or questions for The Bottle Imp, please get in touch! Bannock: a round, flat, thickish cake of oatmeal, barley, pease or flour, baked on a girdle. The word can be used metaphorically; it is possibly from Gaelic bannoch, cf. Latin panicium ‘bread’. At the end of the eighteenth century, it is recorded that such ‘thin, flaccid cakes’ were ‘the ordinary bread of the gentry or lairds’ in Perthshire. Bothy: primitive dwelling or shelter. The form is probably from the same origin as English booth, cf. Germanic bu– ‘to dwell’. Such shelters were commonly occupied by country-folk on field-duty, e.g. shepherds. Thomas Pennant, touring Scotland at the end of the eighteenth century, refers to the Bothay as ‘a dairy-house, where the Highland shepherds, or graziers, live during summer with their herds and flocks, and during that season make butter and cheese’. Common bothy-food at the end of the nineteenth century was brose (see below). The term bothy is often used to refer to a hillwalkers’ shelter, as witnessed by the Mountain Bothies Association. Braw: fine, splendid, worthy, handsome; related to brave. Robert Burns in ‘The Cottar’s Saturday Night’ refers to how ‘Their eldest hope, their Jenny, woman-grown’, comes home to show off her ‘braw new gown’. Cockernonnie: a high coiffure, generally applied to females; the term is occasionally extended to include a head-dress. Can be used metaphorically for a tottering haystack. The first element seems to derive from the verb cocker, meaning ‘to rock or walk unsteadily’, which seems very plausible. Dinna fash don’t be troubled/bothered. Fash is from Old French fascher ‘to annoy, weary’. The term was also commonly extended to mean ‘afflicted’, and Robert Burns uses the term with such a meaning in Holy Willie’s Prayer: ‘At times I’m fash’d wi’ fleshly lust.’ When Outlander‘s Jamie Fraser tells Claire ‘Dinna fash,’ he means ‘Don’t worry’. Dirk: a short dagger worn in the belt by Highlanders. James Hogg refers to how, in the seventeenth century, Highland soldiers each had ‘a sword an’ a gun, a knapsack an’ a durk’. The term was also extended to mean a sort of clasp-knife. Gomerel: a fool or stupid person. In George MacDonald Fraser’s Flashman’s Lady (1977), one character refers disparagingly to a well-dressed, fashionable businessman as ‘anither scented gommeril wi’ mair money than sense’. Ken: know, be aware of, learn, make known. Recent examples can be found in Irvine Welsh’s Trainspotting (1993): ‘The Fit ay Leith Walk is really likes, mobbed oot man. It’s too hot for a fair-skinned punter, likesay, ken? Some cats thrive in the heat, but the likes ay me, ken, we jist cannae handle it. Too severe a gig man.’ and in the name of The Ken Fine Show, a ‘Magazine style series presented by Jack Docherty, which celebrates the Scots language, dialects and Gaelic’. Kine: cows. Cows were always subject to curious diseases; the Memoirs of the Maxwells of Pollok (1650) refer to ‘When kine wer elfe-shote’, i.e. suffering from a disease that was what John Jamieson, the great nineteenth-century lexicographer, stated as ‘supposed to be produced by the immediate agency of evil spirits’. Receipts: recipe or prescription. John Moncreif, in The Poor Mans’ Physician (1731), offered ‘The Receits of the Famous John Moncrief of Tippermalloch; Being a choice Collection of simple and easy Remedies for most Distempers’. The Dictionary of the Scots Language records receipt being used to mean a food recipe in 2003: ‘Ma mither-in-law had a great receipt for pancakes’. Sark shirt, generally male, but the term was used also for a woman’s chemise. The form derives from Old Norse serkr. In 1721, a curious custom is recorded: ‘He was wrap’d in his Mother’s Sark Tail. The Scots have a superstitious Custom of receiving a Child, when it comes to the World, in its Mother’s Shift, if a Male; believing that this Usage will make him wellbeloved among Women.’ And perhaps the most famous sark is the one worn by Robert Burns’s beguiling witch in ‘Tam O’Shanter’. Sassenach: English-speaking person, formerly applied to Lowlanders but later applied to Englishmen or women. The form derives from Gaelic sasunnach ‘Saxon’. When Jamie calls Claire a Sassenach, he is drawing attention to the fact that she is English and a foreigner. He means it as an endearment, but this is not always the case, as Maggie Scott explains in an earlier column for The Bottle Imp. Also see Dinna Fash, above. Tinchel: hunting term in origin, meaning a ring of hunters or beaters who surround a chosen area and gradually close in to catch their quarry; the form can be extended to refer to a pack of animals. John Taylor, the English self-styled ‘Water Poet’ who visited Scotland in 1618, describes the process as follows: [The manner of hunting is this […] [the hunters] doe lie down on the ground till those foresaid scouts which are called the tinckhell doe bring down the deer but as the proverb says of a bad cooke so these tinckhell men doe lick their own fingers; […]’ The word derives from Gaelic timchoill. Wean: child, especially before its teens: a blended form of wee + ane ‘wee one’, and in some parts of Scotland the blend is not complete. Allan Ramsay in 1725 has the following line: ‘Troth, my Niece is a right dainty we’an. ‘ The apostrophe — which may of course be the printer’s intervention — suggests that the blend was not yet complete.